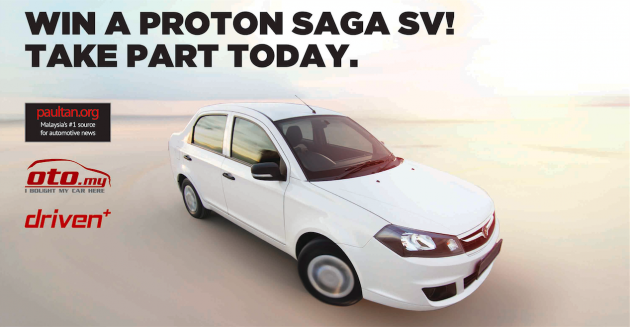 Win a Proton Saga SV Contest - Deadline for submissions extended! As an avid reader of this website, you would already know that you can put yourself in the running to win a brand spanking new Proton Saga SV 1.3 CVT by taking part in our Win a Proton Saga SV contest. This contest was launched in conjunction with the 2013 KL International Motor Show (KLIMS) at PWTC and was scheduled to end on 24 November, which happens to be the final day of KLIMS. Due to the overwhelming interest in the contest, the organisers have decided to extend the deadline by a week, till 1 December 2013. This would allow more participants to take part in the contest. As mentioned, taking part is as easy as snapping your fingers! You just need to download Issue 6 of our Driven+ interactive magazine for free on Apple Newsstand or Google Play and fill up our entry form. We are also giving you the opportunity to double up your chances of winning the Saga SV by simply liking oto.my‘s official Facebook page, hitting the contest tab and answering some questions. So hurry up and take part today! If you plan to visit KLIMS this weekend, be sure to drop by our paultan.org booth (3E01) at Hall 3, PWTC to meet our brand ambassadors. Driven+ and oto.my is brought to you by paultan.org, Malaysia’s No. 1 source for automotive news. Hope can get a car for next year january get car lesen, because home dont have any car for me ,hope this event can let me get a car and i no more worry for cant find any car for drive. That is his HOPE and a WISH! All the best to you, Chen. just like in any tv reality show.